Very sad news out of Denver for all readers of science fiction and fantasy, and for Wild Cards fans in particular. We've just received word that Ed Bryant has died. In addition to all his other considerable accomplishments, however, Ed was also one of my Wild Cards writers. He's been part of the series since the very beginning, contributing a story (a collaboration with his dear friend Leanne C. Harper) to the very first anthology, and appearing off and on in other volumes over the years. 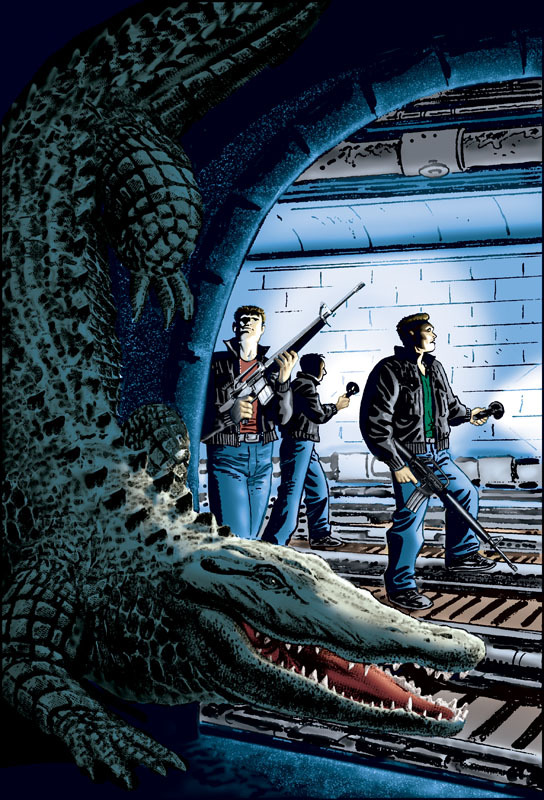 He created or co-created numerous Wild Cards characters, but the one he used most was Sewer Jack, the gay Cajun subway worker who turned into a twelve-foot long alligator in times of crisis. Always a fan favorite, Sewer Jack was last seen in volume twelve, DEALER'S CHOICE... but, perhaps fittingly, he will be back for one last hurrah in the forthcoming volume MISSISSIPPI ROLL, in a story penned by David D. Levine. Ed read and approved David's handling of his character, and was pleased to see him back on stage. 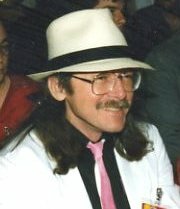 Here's Ed at happier times, from the 1988 worldcon in New Orleans, when WILD CARDS was a finalist for a Hugo Award. We all dressed to the nines that night, and had a hell of a celebration afterwards, even though we lost to Alan Moore's WATCHMEN. I first met Ed in 1971 or 1972, either at a worldcon or perhaps at Harlan Ellison's house. After so many decades, the details fade. But he's been a friend for decades. We partied together at more cons than I can recall, competed for Hugos and Nebulas and occasionally for women, attended Milfords together and critiqued each other's work. He visited Santa Fe and stayed at my house, I visited Denver and stayed at his. Out here in the west, Ed was often asked to preside at cons as a toastmaster and master of ceremonies, a task at which he excelled. He had a wry, dry wit, always funny, never cruel. 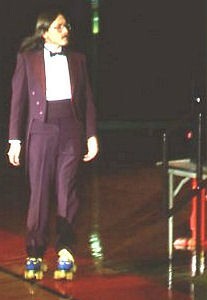 No one who attended the 1981 worldcon in Denver will ever forget Ed in his maroon tails presenting the Hugo Awards on roller skates. So far as I'm concerned, he's right up there with Connie Willis and Robert Silverberg as the Best Hugo Hosts Ever. Fandom and the world of science fiction will miss his gentle wit, his easy laugh, his talent. For for those of us who were his brothers and sisters in Wild Cards, our universe will never be the same. One of our aces has fallen. Commiserations. Have been going through a lot personally recently, with serious illnesses of beloved family members, friends, and even friends' pet. Very best to Ed's family and to you and yours. I really hated writing that obituary, but all I could do is try to give him a good send-off. I didn't know him well but he was one of the warmest, funniest people I knew in the field, and I always enjoyed our interactions. His writing was a big influence on mine, too, especially Cinnabar. We'll have some pictures and, I'm sure, a lot of appreciations in the next issue of Locus. I'm sorry for you're loss. I appreciate that he made a contribution to a much wider circle but personal relationships are what makes life special. I was just listening to the 'The Second Coming of Buddy Holly' from WildCards V on audiobook when I read this. I'm sorry for your loss Mr Martin, he was a fine writer, though from what you have written I'm sure he was a much finer friend. It's difficult to lose a friend who just so happens to have been a great man to all as well. That's really sad news-when ever somebody who has been a part of our lives leaves it, there is a hole left that doesn't ever seem to fill. I just noted today that John Buscema the great artist died in 2002, and I still think about him and the work he did-and still miss him. Don't get me started on Jack Kirby. Sorry for your loss and our loss. I've never even heard of him until now, but now I wish I had known him. You have my condolences. He was a regular at TusCon. I always looked forward to seeing him as Toastmaster there. He will be missed. And, as a fan of the Wild Cards universe, I am of course also sad to hear these news. When I am reading a story, that makes me forget my entire surroundings, it sometimes feels like I am connecting with the characters as well as the authors. This is really sad. I've been a Wild Cards fan since forever, and that means I've been enjoying Ed Bryant's wonderful stories since forever, particularly the one about Sewer Jack meeting a returned Buddy Holly, and the couple of ones with the aboriginal sorcerer Wyungare. As much as I like the new writers, I missed him in the new books. I'm very sad to know of his death. My condolences to his friends and family. I am so sorry to read this, George. Ed was indeed one of the most witty, warm, engaging and entertaining speakers you could ever hope to hear. His writing was great, but his personality was even greater. He was a true "one off", and the world is very much emptier for his passing. Rest in peace Ed - you were very, very well loved. I didn't know him myself, but he was a mentor to a couple of my close friends, and I'm sad that we've lost him. Many condolences. When I mentioned the other day that some of my favorite stories in the 1st wild card anthology were by people I'd never heard of, the one with Sewer Jack and Bagabond and CC Ryder was possibly my favorite in the entire anthology. So sorry to hear he passed away. Since 2011, I had been working with Ed Bryant in order to compile, organize and edit a complete retrospective of his 50-year career, under the title "On the Road to Cinnabar". We were nearing the finish line when Ed suddenly passed away in February. I am now finishing the work with the assistance of Dawn Dunn, his literary executor. Among outstanding items was the use of a short biographical piece which you wrote about him in the 1984 Westercon program, entitled "Ed Who?". Ed was supposed to ask you for permission when the two of you were in Tucson for the convention last Fall, but I gather he forgot, and I did not want to press him since I found his voice rather fragile in our subsequent telephone conversations. If you were so kind as to authorize the inclusion of that piece in the retrospective, that would be much appreciated (of course, this being a small press project, this would be on a complementary basis, if that is okay with you). Currently, the project stands as being 2 print volumes and 1 or 2 digital CDs, comprising almost all his fiction, a generous sampling of his non-fiction and some graphic adaptations of a few of his short stories. I intend to include a selection of his most interesting convention reports, and so I've been trying to secure the authorization of people who wrote fun bios and other similar pièces in convention programs over the years. I will be attending Ed's memorial in Denver this coming Sunday and if you're there we can discuss further in person. Otherwise, it would be much appreciated if you would grant me that authorization.